Narcissus pseudonarcissus, the wild daffodil, originated in western Europe. Ranging from France through Britain and Germany, the daffodil has a widespread distribution across Europe. Despite their main presence in western Europe, daffodils have moved throughout the continent, relying on varied habitats to claim as their own. 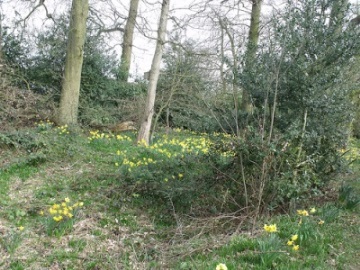 In Great Britain, Narcissus pseudonarcissus flourishes in several large nature reserves, preserving the species from habitat destruction due to agriculture. Although wild daffodils grown primarily in Europe, they can be cultivated in gardens around the world, if given proper care. The wild daffodil does not have a distinct preference for specific native habitats. This plant is known to grown in grasslands, forests, along riverbanks, and in rocky areas. It does not require a certain altitude for growth either, and has been found in various native habitats from low-lying marsh regions to high mountain crevices. Although the daffodil does not display an affinity for a special type of habitat, it does need a dormant period in which it can avoid predators and save water. The plant flowers in the springtime, and undergoes its dormant period during the summer, in the form of a bulb, which survives underground. Narcissus pseudonarcissus also is picky about temperature. In order to grow in the spring, it requires a cold period, which is fulfilled by typical winters in Europe. Cold temperatures might seem counterintuitive to the growth of a daffodil. However, the cold allows the plant to extend its stem rapidly, and proceed to bloom while maturing. The daffodil's niche is diverse and includes many other organisms. 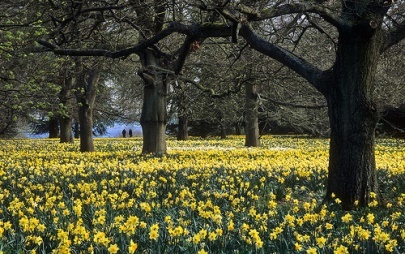 Besides relying on the sun to allow for photosynthesis, and rainwater as well as groundwater to facilitate growth, daffodils also are important producers for their environment. Insects and slugs are essentially the only organisms that can consume daffodils safely, due to the toxicity of the daffodil's poison. This poison is explained in more detail on the facts page. However, bees and other insects interact commonly with the daffodil, helping to fertilize the plant and spread its pollen. Relationships between the daffodil and other organisms can be explored more on the interactions page.